My name is Matthew Kelm and I am the Chief of the Chippewa Falls Police Department. On behalf of myself and all of our officers and staff I would like to welcome you to our website! We strive hard to keep the content here current and engaging. We as a police department are at our best when we are working with community members like you. Please feel free to send us suggestions on what you would like to see more of here. If you live here in Chippewa Falls let us know what is important to you as a citizen of this community. If you are interested in moving here or learning more about what our department is all about, let us know what you want to know. We are dedicated to being as transparent and responsive as we can under the law and in keeping with the principles of the 21st Century Policing Guidelines. Our job is to make the community a safer and better place to live. Let us know what we can do for you. 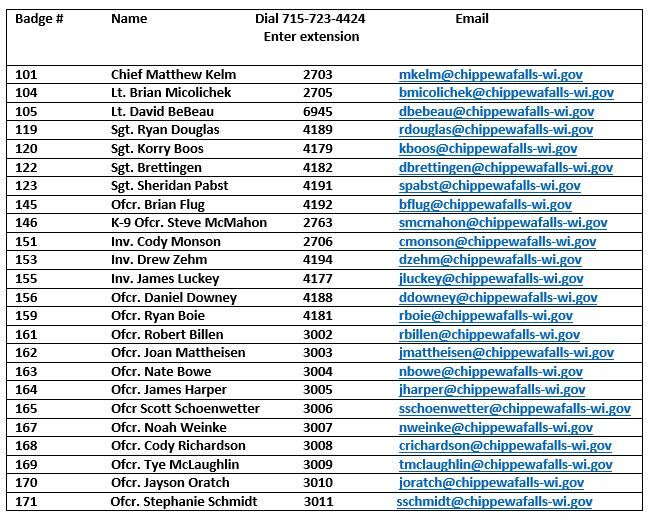 The Chippewa Falls Police Department is a full-time police department responding 24/7/365 to calls for service within the City of Chippewa Falls. Police, Fire, and EMS services are dispatched through the Chippewa County Communication Center. For questions regarding obtaining police reports, dog/cat licenses, and other general administrative questions--the business office is open 7:30 am to 4:30 pm, Monday through Friday and can be reached at (715) 723-4424. In the event of an emergency, immediately dial 9-1-1. We're Hiring! Applications are now being accepted through April 25th to fill a full-time Police Officer vacancy and to establish an eligibility list for 2019. Choose a link below to learn more! Is the Chippewa Falls Police Department the right place for you? The Chippewa Falls Police Department is a very special place to work. We provide professional police services to a city of 14,000. The size of our police department is a perfect balance for officers who are looking for opportunities early on and throughout their careers but desire to work with a close-knit group of officers. We look for ways to invest in our officers, including in-house and outside training opportunities. We have a history of promoting a feeling of family and teamwork here at the Chippewa Falls Police Department and we live our values of Compassion, Commitment, and Integrity every day. We do allow our officers to have neatly trimmed facial hair as well as non-offensive visible tattoos with permission from the Chief. Please take time to explore our website and look at what we are all about. Many people come into the police field looking to specialize in areas they are passionate. We have many opportunities including Internet Crimes against Children, SWAT, Sensitive Crimes, Tactical and Firearms Instructors, Bike Patrol, Social Media and Public Information, Honor Guard, Financial Crimes, Drug Investigations, Evidence Technician, School Resource Officer, and through strong public support we now have a K9 program. If there is an area of law enforcement you are interested in, chances are we have it, and you will have an opportunity to play an important role. We are passionate about serving our community here in Chippewa Falls. The City of Chippewa Falls is a growing community located a short distance from Eau Claire and about 90 minutes from the Twin Cities. Our community is known for its small town feel with generous and friendly citizens. We have several parks including Irvine Park with its’ zoo and the new Riverside and Erickson Parks. We also have the Northern Wisconsin State Fairgrounds that hosts many events annually. The recreational opportunities and excellent schools here in Chippewa Falls make it a great place for families. If you feel this is the kind of community you would like to serve, please apply today. The Assessment Center begins at 8:00 am on April 27 at the Chippewa Falls Police Department. We will contact you once we have received your application to assign your time. Chippewa Falls PD swore-in their newest officer on 03/18/19. The Chippewa Falls Police Department has partnered with CARFAX for easy online access to crash reports. Please note that there is still no parking in the Downtown Business District between 2am and 6am. This remains in place all year round.